We’ve assembled some highlights about Home Sweet Home, Apollo House and the movement in Ireland which is drawing attention to the homeless crisis there. Much has been reported over the last 10 days and undoubtedly much more will come in the future. We invite you to dig deeper into understanding this crisis and ask you to please support your local homeless agencies. Home Sweet Home is a movement to end homelessness in Ireland. It is a coalition between homeless support organisations, trade unionists and artists to draw attention to the housing crisis, start a national discussion and put pressure on the government to act. On December 15th the Home Sweet Home coalition took over a 10-story office building named Apollo House in central Dublin. It is one of over 190,000 NAMA buildings that are currently vacant in Ireland. Apollo House was previously the location of the Social Welfare Office and has been empty for 6 years. Very recently, Dublin City Council granted permission to the receivers in charge of the building for it to be demolished in six months. We are going to go in, turn on the electricity, turn on the water, turn on the heating and gather up as many homeless people as need a roof over their head. This has been very well planned and the building is safe. 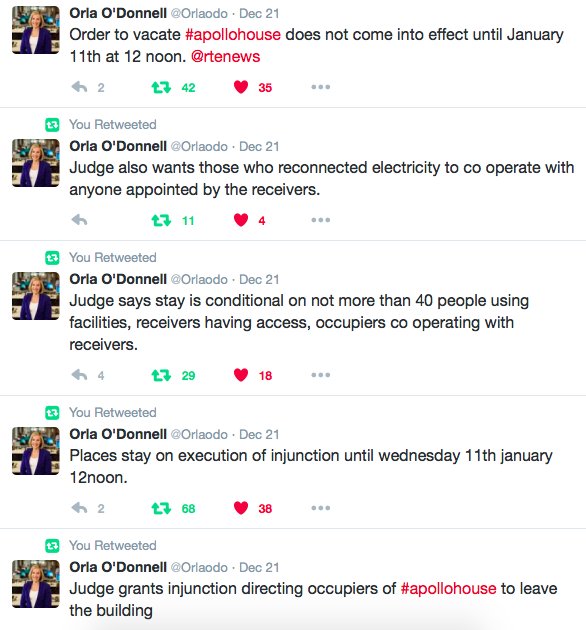 Apollo House was never intended to replace homeless services, but to help deal with the overflow they cannot handle. This video explains the intake procedure for homeless people and how anyone who stays there is empowered to contribute their skills to the running and organisation of Apollo House, which in turn builds community and enables dignity. As the Home Sweet Home movement gained attention in Ireland, CNN was the first major international news agency to cover Apollo House. A funding campaign was launched by the Irish Housing Network as part of Home Sweet Home’s coalition of agencies. This was an act of defiance as much as an act of humanity. We'll sing a few songs at lunchtime tomorrow our side the Apollo mission! Poolbeg st, 1-2pm tea and a welcome..
Come along! Sing a song..
On Tuesday, December 20, Glen Hansard and friends, including Hozier, played a one hour gig at Apollo House to raise awareness about the homeless crisis in Ireland and pressure the government to take action. I haven’t sang this in a little while, so a bit of help would be more than appreciated. I’ll give it a bash. Fair play for coming lads, fair play for showing your support. And a happy Christmas. Singer-songwriter Lisa Hannigan released her version of Silent Night on Bandcamp as a fundraiser for Home Sweet Home. Public enthusiasm and overwhelming support for the movement has been growing through the first week of occupation. On Thursday, December 22 the receivers for the government-owned building sought an injunction in the high court for the occupiers of Apollo House to vacate the building. Hundreds of supporters were there to show their support. The judge granted the injunction to the receivers but entered a stay until January 11, allowing the volunteers and residents to remain through the Christmas season. Hot Press captured the statement by Home Sweet Home advocates on their way out of the court. The feeling was that they had accomplished something by preventing any more homeless deaths on the street and having the judge acknowledge that there was not enough suitable accommodation for the homeless in Dublin. National and international attention is still growing, keeping the issue at the forefront of the news in Ireland. There are reports now that a second NAMA building has been occupied for the homeless in Sligo. Glen Hansard spent an hour on the Irishman Abroad podcast to talk about homelessness in Ireland and Home Sweet Home. For more information about the movement, visit Home Sweet Home’s Facebook page or their Twitter account. To make a monetary donation, please visit their GoFundMe page. Material donations are no longer being accepted, however, the group urges you to get in touch with other organisations in Dublin who support the homeless. To volunteer with Home Sweet Home, please complete this form.